Cutegram is an open-source Telegram application, similar to Sigram. It is developed in Qt5 and QML and uses the libqtelegram and the libappindicator libraries. 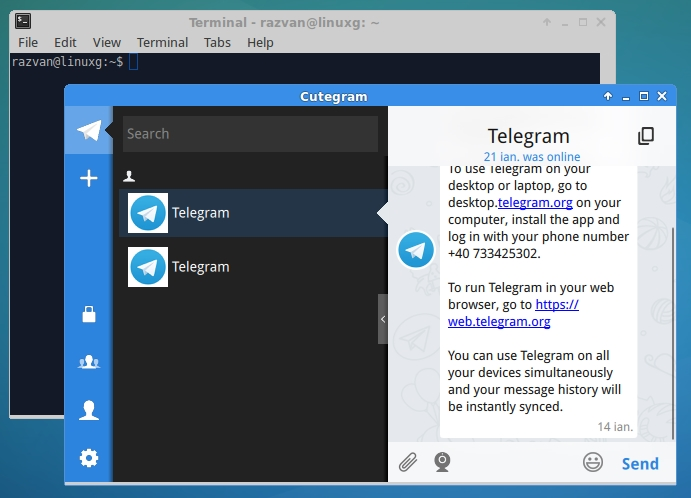 Like other Telegram clients for Linux, it has support for Emoji, allows the users to send data by dragging it in the message window and gets integrated with the system notifications. It’s the last release of the Cutegram 2.x. We’re working on the Cutegram 3.x series with many new features and improvements. Cutegram is available via PPA on Ubuntu and derivative systems [installation instructions HERE], but it can be easily installed on other systems also. The project’s website provides official .run binaries , so in order to install Cutegram on the most popular Linux systems you need to download the .run file for your system’s architecture, set execution permissions and run the cutegram*.run file. The below instructions should work on Ubuntu, Linux Mint, Pinguy OS, Elementary OS, Deepin, Peppermint, LXLE, Linux Lite, Robolinux, Debian, SparkyLinux, Fedora, CentOS, OpenSUSE, Mageia, OpenMandriva, Arch Linux, Manjaro, Antergos, ArchBang and other systems.